Also known as a roll mat, a ground pad or an iso mat, a sleeping pad is a very useful device for campers and outdoor adventure lovers. Mostly used with a sleeping bag, a sleeping pad provides cushioning and thermal insulation hence ensuring utmost comfort to its user. Some of the best backpacking sleeping pads use air as a form of insulation and it is a necessity to those who like ultra-light backpacking. The best sleeping pads can be used anytime, anywhere and at varied spots in the wild, in a camping car or in a camping tent. Made of professional grade ultra-light 20D nylon with high-end TPU coating, the OutdoorsmanLab is a long-lasting sleeping pad that never disappoints. With this sleeping pad, you will be in a position to beat the water leaks, abrasion, tear and any kind of weather. At a lower cost, you get a packing that would otherwise cost hundreds of bucks, for lack of a better word choice. A unique feature about this sleeping pad is the air cell design that makes it thick (2 inch thick) and comfortable at the same time. You will nolonger have to worry about uneven grounds or rocky grounds with this self-inflating sleeping pad. What makes this sleeping pad our favorite is the light weight and small packing size. Weighing about 15 oz only, this pad packs into a size smaller that your travel umbrella. It is easy to inflate with about 10 to 15 breaths only. Deflating is also not a hassle. Ultimately, this is the best sleeping pad for backpackers. With its versatility, the OutdoorsmanLab sleeping pad can be used on its own or with a variety of sleeping bags. Its comfort is unquestionable and it is not surprising that it almost lacks a con. It is comfortable and can be used on uneven grounds. Not ideal for insulating against extremely cold temperatures. The OutdoorsmanLab sleeping pad is definitely the best backpacking sleeping pad in the market. It is well reviewed by customers and the services it offers live up to the testimonies. You will never be disappointed for considering this sleeping pad. The Klymit Static V lightweight is an ideal sleeping pad for avid backpackers and casual campers alike. One of the best if not the best in the sleeping pad business. The sleeping pad design allows for side rails. The side rails cradle you on the sleeping pad ensuring that you are centered in the pad and well tucked in. It is an ideal pad especially for side sleepers and those people who toss and turn frequently as they sleep. The sleeping pad is designed using lightweight and rugged material. It weighs only 18 ounces thus very easy to handle and carry around. The rugged material and ultralight, 75D polyester, comes in handy when you want to sleep on the ground. It provides superior tear, puncture, and abrasion resistance. The pack and storage design maintains compactness. The pad is very compact and thus easy handling. A patch kit, stored in a small integrated pocket on the pads storage bag, is included for emergency repairs. The pad has an ergonomic body-mapped V-chamber design. This limits movement of air within the sleeping pad. The V-shaped body mapping design also delivers superior support and comfort. You can sleep as you please; on your side, stomach or back thanks to this design. The pad boasts of deep weld patterning. This creates expansion zones which allow the pad to fully loft beneath you and in effect improving thermal comfort of the pad. A secure and simple twist-pull valve allows for easy inflation of the pad. The valve also opens wide for rapid and complete deflation. This design creates a secure seal that helps prevent inadvertent opening. A common person will inflate the pad in just 10-15 breaths. It is very light and easily portable. Ideal sleeping pad for side sleepers. Can be used in rugged terrain. The Klymit Static V lightweight is a very comfortable, ultralight and affordable sleeping pad. It is undoubtedly one of the best, if not the best, for hiking. There is hardly any flaw in its design and you will definitely get value for what you spend on this sleeping pad. With a maximum R-value of 9.66, the Lightspeed Outdoors XL Super Plush is a sleeping pad that never disappoints in terms of warmth and comfort. Among the salient features of this sleeping pad is its 3-inch thick foam that provides more than sufficient insulation against both physical and weather insults. The integrated pillow, together with the aforementioned features, make the Lightspeed Outdoors XL Super Plush FlexForm one of the most comfortable sleeping pads. The fact that this sleeping pad is made of non-PVC material means that plastic odors and crinkle noises that would otherwise disturb your sleep are put at bay. And, if you are looking for an extra-sized sleeping pad that can fit two individuals, this is definitely a catch for you. It measures 77 inches by 30 inches when unfolded. This self-inflating sleeping pad has an oversize air valve for easy inflating. It comes with a classy carry bag and compression straps that make it easy to carry. With a packed weight of 6 pounds, the Lightspeed Outdoors Super Plush is not the lightest of sleeping pads but given its many salient features and comfort, you wouldn’t mind the weight for the luxurious feel in the wild. If anything, this is the best sleeping pad for car camping. Best sleeping pad for tall people. Big size for large individuals or for two. The most comfortable sleeping pad. Not so easy to deflate and fold up. Somehow heavy and unsuitable for backpackers. It is best for car camping. The Lightspeed Outdoors XL Super Plush Self-Inflating Sleeping Pad is one of the most luxurious sleeping pads in the market. It is large enough to accommodate up to two individuals. In as much as it weighs much more than other ultralight sleeping pads, all the comfort it offers makes it a perfect choice. If you need the best car camping sleeping pad, this is the catch for you. The Teton Sports Camp pad is a universal camp pad made of a thick open-cell polyurethane foam. The polyurethane foam helps the pad retain its shape and loft even after being rolled up for many times. The camp pad has integrated top pillow pockets. These keep pillows off the ground especially for people who toss and turn frequently in their sleep. This pad boasts of a soft brushed canvas shell. This enables the pad to be cleaned with ease. Notably, the Teton pad can be compressed to a 14-inch diameter roll using an innovative roll assister. Built-in compression straps, a soft removable cover and pockets that allow for storage of valuables are also part of the pad's design. The built-in compression straps have buckles which keep the pad tight. It can, therefore, be easily stored and carried for camping and outdoor events. The camp pad can fit into any design universal cot and can be used as a standalone ground pad. Can be used as a general purpose sleeping pad. No inflation and deflation required. Not comfortable especially when used on the hard ground. 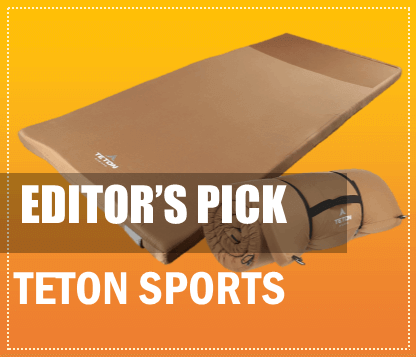 The Teton Sports Camp pad is not without shortcomings but it is a worthy sleeping pad. Some may argue that one does not get value for the amount spent, to some extent that may be true. The potential benefits of the pad marginally outweigh its shortcomings and it is, after all, a worthy sleeping pad. Another one from Klymit, the insulated static V is a comfortable backcountry pad that is designed to provide winter insulation and all-season comfort. The sleeping pad packs light and is exceptionally compact. It also boasts of a body mapped shape and a V-chamber design which together minimize air movement within the pad. Air movement impacts on insulation and therefore, the thermal efficacy of the pad is reduced. The chambers are filled with light, lofty Klymalite synthetic insulation. This adds another layer of protection from the cold ground. Klymalite is also compressible, lightweight and durable. Dynamic side rails are also part of the pad's design. They are integrated into the patterning and construction of the pad. They cradle you comfortably on the pad for a more restful sleep. In addition, deep weld patterning creates expansion zones that allow the bag to fully loft beneath you and thus improved thermal comfort. A secure and simple twist pull valve allows for inflation in as few as 10 breaths. It also opens wide for rapid and complete deflation. Thanks to this, a secure seal is created and it helps prevent inadvertent opening. The pad has a super light design. It is incredibly light and can therefore, be carried easily. The 75-denier polyester in addition to durability makes the pad ultralight. Packs light and is very compact. It is a multi-purpose sleeping pad. The Klymite Insulated Static V is a sleeping pad with minimal faults. It is one of the campers’ and hikers’ favorites. You should definitely consider it when choosing a sleeping pad. A slightly heavier pad than its counterpart the Alps Mountaineering Lightweight series. It has a Jetstream polyurethane pump technology just like its counterpart. It can, therefore, be inflated and deflated with ease. The bottom of the sleeping pad is optimized for minimal slippage. It is designed from DOT PVC. The dots allow the pad a better grip. The anti-slip design is important if your sleeping arrangement is in such a way that the pad is placed directly on the tent’s surface. This design comes in handy for restless sleepers, those who toss and turn very frequently during sleep. The top material is softer to touch and it has a smooth, velvet-like feel. Similarly, the valves of the pump are made of non-corrosive brass. They are easy to operate and inflate. The pad inflates or deflates within 2 minutes. The pad packs like a foam mat. It can also be easily strapped onto the side of a backpack for carrying. A repair kit and a stuff sack are part of the pads’ packing. The pad is not lightweight and not compact. The pad is a bit bulky for backpack hiking but it is perfect for car camping. Long inflation and deflation time. A convenient self-inflating sleeping pad, easy to use but it is not without shortcomings. The pad takes long to inflate and deflate and it is bulky. There are better options for the price but its comfort and anti-slip design makes it worth consideration. Another top shelf sleeping pad, the Alps Mountaineering Lightweight series is a durable, comfortable and inflatable pad. The pad is not without shortcomings. It is humongous in size and thus it may be viewed as a luxury for camping. The self-inflating valve design of the pad makes it easy to inflate and deflate the pad. You should not forget the double brass on the valves which are non-corrosive. The pad inflates and deflates quickly thanks to the jet stream polyurethane foam that is part of the pad's features. The pad is designed using tough top fabric. This guarantees the long-term durability of the sleeping pad. Lightweight rip-stop material and a bottom polyester taffeta complement the tough top fabric and in addition make the pad relatively light. The pad has an added benefit in that you can add an air pad as you deem fit. The air pad makes you warmer and more comfortable, thus comes in handy for a well-rested sleep. The pad’s packaging includes a stuff sack, a repair kit, and compression straps. The stuff sack allows for stuffing of the pad when not in use. A repair kit is useful when the pad needs some adjustments. Despite these, rolling the pad is a bit cumbersome since you may need to kneel on it as you roll to expel the little air remaining after it has been deflated. Getting the pad back into its cylindrical storage sack might need a rather tight squeeze. The pillow area is thicker. It is a large pad, even when rolled up. It is hectic to roll the pad back into its storage bag. The Alps Mountaineering Lightweight Series sleeping pad may be a bit big, but it is definitely worth its value. A strong and durable, comfortable and warm pad, it should definitely be considered as one of the best in the business. The Therm-a-Rest Ridge Rest SOLite boasts of a reflective layer. The reflective layer increases warmth and does not add any weight to the pad. A layer of insulation as part of the pad's design aids in warmth retention and durability. It is ideal for 4-seasons of sleeping. The sleeping pad is durable and has just about the right weight for the normal camper or hiker. It is heavier than its counterparts but this added weight confers extreme durability to the pad. The pad has closed cell foam pads that can be easily shaved on the sides or along the length to save on weight. The pad can be used in just about any situation be it car camping, backpacking or mountain climbing. It is one of the largest sleeping pads on the market and it is also not as comfortable as other sleeping pads. Regardless of the plush inflatable pads in the design, the pad cannot contour your body and disperse weight evenly throughout. You are likely to feel a stone underneath and you will be aware if you are sleeping underground. Simple and easy to understand design. Can be used in many situations. Grooves may collect dirt or snow. An excellent closed cell foam pad. It is extremely durable and affordable. This sleeping pad is definitely among the best there are for its worth. You shouldn't overlook it when choosing a sleeping pad. One of the most versatile lightweight closed-cell sleeping pad. The pad works in just about any camping situation. In most instances, the pad is used solely but it can also be used to supplement other inflatable pads. The pad, like its counterpart the Therm-A-Rest Ridge SOLite, has a reflective coating that functions to preserve warmth. The pad has half an inch of foam. The relatively thin pad cannot support nooks and crannies on smooth ground. The thick air construction mats do not have the ability to absorb lumps and this is a huge deterrent to the pad's comfort on uneven terrain. As mentioned earlier, the Therm-A-Rest Z Lite Sol sleeping pad is a very light pad. It weighs only 10 ounces making it among the lightest sleeping pads on the market. The weight can also be trimmed by tailoring the edges to give the pad a mummy shape. The folding nature of the pad makes it an able replacement to the back panel of many backpacks. Small dimples in the pad are designed to help in the folding of the pad and in addition, aid in warmth retention. The dimples are not without fault. They fill with dirt or snow and therefore the need to brush regularly. They also increase the surface area of the bottom of the pad maximizing the amount of heat that can be lost to the ground or snow below. The pad packs small thanks to the dimples and accordion style way that it folds. A very likable feature of this pad is that it is very tough and in effect durable. The pad can be used in a vast number of terrains without getting damaged. The pad boasts a superb level of versatility. In addition to supplementing other pads, it can be used to splint a fractured bone, as a sitting pad inside a snow kitchen, as a chair around camp or to line the inside of a haul bag to avoid abrasion from the inside. Versatile and can be used in many camping situations. Dimples collect dirt or snow. The Therm-A-Rest Z Lite Sol may not be as comfortable as other sleeping pads but it makes up for this in other areas. It is as versatile, warm, strong and durable as any sleeping pad can be, but it is a tad better than the rest. You should definitely consider this as an option when choosing a sleeping pad. The Klymit Static V Luxe brings the comfort of home to the backcountry. It is a massive and stable sleeping pad that offers plenty of room. It packs small and it is ultralight. This sleeping pad hits the sweet spot where comfort, technical performance, durability and lightweight packability come together. The pad has a 30-inch width which provides room to roll and dynamic side rails integrated into the patterning and construction which keep you on your pad by centering you. The side rails also inhibit air movement while tossing and turning. The ergonomic body mapping design of the pad optimizes on comfort and the V-chamber design apart from making it the best sleeping pad for side sleepers, also limits air movement to help maintain maximum insulating performance. In effect, this delivers superior support and comfort. Deep weld patterning creates expansion zones that allow the bag to fully loft beneath you. This ensures that you are warm and comfortable as you lie on the pad. The pad inflates easily. A simple and secure twist pull valve allows for easy and rapid inflation and deflation. Weighs 27 ounces thanks to the ultralight 75D polyester material. The polyester material also makes the pad strong and durable by providing superior tear, puncture and abrasion resistance for minimal weight. It packs in its storage bag to about the size of a one-liter water bottle. This provides compactness and protection while traveling. The sleeping pad boasts of Antimicrobial Laminate internal lacing. This inhibits the growth of microorganisms that can cause odors and material damage. Antimicrobial lacing that inhibits the growth of odor-causing and material damaging microorganisms. Not as lightweight as its counterparts. A very spacious, strong and durable sleeping pad. The Klymite Static V-luxe sleeping pad may not be the most comfortable sleeping bag but what it lacks in comfort is made up for in warmth, ruggedness, and ultra-weight. This sleeping pad should definitely feature as a choice when choosing a sleeping pad. Sleeping pads play very important roles for getting a good and solid night's sleep outdoors. They are important in cushioning and insulation. A sleeping pad's ability to keep you warm throughout the night is often the most important and useful function. How do you choose a sleeping pad for camping or backpacking? Types of sleeping pads: There are three basic types of pads. Each performs differently and it may be either air, self-inflating, and/or closed-cell foam. Intended use: Which activity do you intend to use the sleeping pad for — backpacking, car camping or winter camping. Of note: you should try the sleeping pad in person before making your final decision. Lie down on your back or side as you would typically sleep, and try rolling on the pad as well. This will give you a sense and feel of the product that you want to buy and whether it is as comfortable as you would like. You should also check and assess the weight and packed size of the pad. Air pads are very light and they are ideal for backpacking. Most currently produced air pads contain insulation or reflective materials that serve to increase warmth. They are usually manually inflated using the mouth and they can be inflated in less than five minutes. However, a built-in hand pump features in some sleeping pad models. Other brands offer a lightweight bag-style external hand pump. Air pads are incredibly comfortable and lightweight. They are the most compact type of pad when packed. 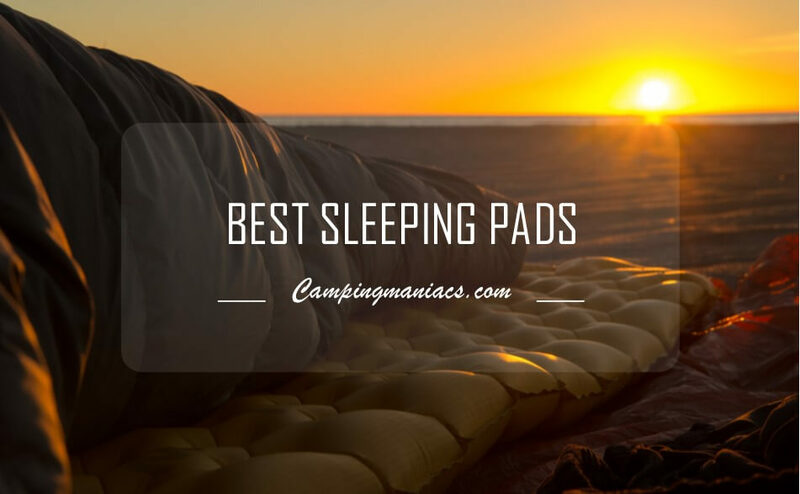 Most air pads are designed for backpacking or camping in warm conditions. Additional insulation design is a feature used in sleeping pads that are meant for four-season use. The firmness of the pad can be customized by releasing some air from the valve while you’re lying on it. Even then, air pads are not without shortcomings. The lighter and more compact they are, the more expensive they are. They can be easily punctured or ripped especially when shared with pets such as dogs and/or cats. Field repairs can easily be done and also most of the pads come with repair kits. Outside temperature fluctuation gives the pads a feel of loss of air. In such instances, you should blow them up right before you go to sleep. Breath moisture can get trapped inside the pad leading to freezing or mold issues depending on the season. Use of a hand pump will help prevent moisture build-up. Some pads may make a loud crinkly sound when moved around. This can be very annoying. Self-inflating pads offer a combination of open-cell foam insulation and air. You should open the pad’s valve after which air fills the chambers automatically. Some pads are designed for the sole purpose of backpacking. Their length can be folded and then rolled up to fit inside your pack. Pads designed for car camping are rolled up without folding. Self-inflating pads are among the warmest, widest and compact of sleeping pads that are in the business. They offer excellent insulation and the firmness can be adjusted by adding or releasing air. The strong fabric design makes the pad a good choice for children. The pads don’t feel like they lose air at night. They are heavier and more expensive than simple foam pads. They may also not be as compact as air pads. They can be easily punctured or ripped but field repairs are not difficult. It is made of dense foam, filled with tiny closed air cells. They’re usually rolled up or folded in a Z formation. They are lightweight, inexpensive, durable and offer good insulation and in effect warmth. These pads durable design make it able for you to use the bag in any terrain. They can also double as seat pads in camp. They are less comfortable than air and self-inflating pads. They’re relatively stiff and firm and as a result, they end up being bulky. A thicker and larger sleeping pad offers very good comfort but only when you are not limited by size and weight. They are often less expensive than their lightweight counterparts. For car camping, self-inflating sleeping pads are definitely the pads of choice. Self-inflating sleeping pads offer good sleep comfort for backpackers. They are of varied thicknesses, durability, insulation value and weight. With optional chair kits, your sleeping pad can double as a comfortable seat, complete with a backrest. This can be a lightweight luxury for backpackers. A low weight and a small packed size sleeping pad is an overriding factor. An ultralight sleeping pad is most likely the best considering the pad has other features that make it worthy. Thanks to modern technology and evolution of sleeping pads, some insulated full-length sleeping pads weigh less than a pound. You should certainly look at the packed sizes of sleeping pad options and factor that into your decision. Low weight is the ultimate deciding factor when choosing a pad for thru-hiking. Strength and durability of the pad are also key. Closed-cell foam sleeping pads are your best bet. Many thru-hikers favorite is a "short" or "3/4 length" foam sleeping pad that saves on weight. If needed, an empty pack or extra clothing under the feet can be used to provide a bit of insulation and warmth. Camping on snow requires more insulation and thermal efficiency. The use of either an insulated sleeping pad or a self-inflating pad atop a closed-cell foam pad is recommended. These sleeping pads are thermally efficient and provide you with the much-needed warmth during the winter season. The closed-cell foam pad adds insulation and offers insurance in case the inflatable pad gets punctured. To counteract the body’s heat loss to the ground even during summer, most air and self-inflating pads have a layer of synthetic insulation inside. Sleeping pads geared towards sleeping in very cold environments offer down insulation. A sleeping pad's R-value measures its capacity to resist heat flow. The higher a pad’s R-value, the better it can insulate you from cold surfaces. The R-values range from 1.0 (minimally insulated) to 9.5 (very well insulated). The R-value or temperature range helps you gauge how much insulation the pad provides. Thicker pads generally offer higher R-values. The average summer camping pad should have an R-value 3.0 or lower. Campers who sleep cold may want to choose a pad with an R-value of at least 4. Unlike sleeping bags, choosing a higher warmth rating in a sleeping pad won’t lead to overheating. Ultralight pads are excellent for backpacking but they tend to be more expensive. You can save on a pads weight by choosing a mummy or tapered shape that reduces volume and packs smaller. Closed-cell foam pads with short lengths are quite low in weight. At least your shoulders and hips should be able to fit on a pad. Regular (72 inches long) and long (78-inch) pads insulate your legs and feet very well. This comes in handy during chilly fall or winter. A short or 3/4-length pad (47 or 48 inches long) weighs less and packs smaller. Folded clothing or your pack can be put under your legs and feet to offer additional insulation. Almost all sleeping pads offer a standard width of 20 inches. Tall people can opt for a pad with a width of 25 or 30 inches. Often the “long” version of a pad defaults to being wider as well. Some styles may offer a wide pad that is still “regular” length. Some pads have larger side baffles. The side baffles are called rails. They cradle you and help keep you from falling off as you turn while sleeping. They are especially nice for children. A pillow baffle feature in some sleeping pads allows for your head to rest. A high-volume inflation valve and deflation valve in some pads to control the speed at which air flows in or out. Neck openings allow for fast inflation with fewer breaths. Pads with separate inflation chambers or layers are best suited for use when in cases where the pads are prone to fail. If one layer fails, the other will still give you some cushioning. A pad with a textured or brushed-fabric surface is best suited for restless sleepers. This helps keep you and your sleeping bag from sliding off during the night. It is our utmost belief that with this information at hand, you should be able to make an informed decision before investing any of your cash on a sleeping pad. We believe in qality and quality is what we review. By relying on our opinions, we believe that you should be able to save yourself the trouble of faraging for the best backpacking sleeping pad in stores. Rather, you should read our recommendations and narrow your search while picking the best. Take your home bed comfort to the wild, with a well-designed sleeping pad.